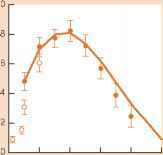 Figure 4.18 Reproductive value generally rises and then falls with age, as explained in the text. (a) The annual plant Phlox drummondii, described earlier in the chapter. (After Leverich & Levin, 1979.) (b) The sparrowhawk, Accipiter nisus, in southern Scotland. Solid symbols (±1 SE) refer to breeders only; open symbols include nonbreeders. (After Newton & Rothery, 1997.) Note that in both cases the vertical scale is arbitrary, in the sense that the rate of increase (R) for the whole population was not known, and a value therefore had to be assumed. reproduction), but the more cones they produce the less they grow (Figure 4.19a). 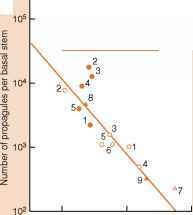 Male fruit-flies benefit both from a long period of reproductive activity and from a high frequency of matings, but the higher their level of reproductive activity earlier in life the sooner they die (Figure 4.19b). Yet it would be quite wrong to think that such negative correlations abound in nature, only waiting to be observed. On the contrary, we cannot generally expect to see trade-offs by simply observing correlations in natural populations (Lessells, 1991). In the first place, if there is just one clearly optimal way of combining, say, growth and reproductive output, then all individuals may approximate closely to this optimum and a population would then lack the variation in these traits necessary for a trade-off to be seen. Moreover, if there is variation between individuals in the amount of resource they have at their disposal, then there is likely to be a positive, not a negative, correlation between two apparently alternative processes - some individuals will be good at everything, others consistently awful. For instance, in Figure 4.20, the aspic vipers (Vipera aspis) in the best condition produced larger litters but also recovered from breeding more rapidly, ready to breed again. 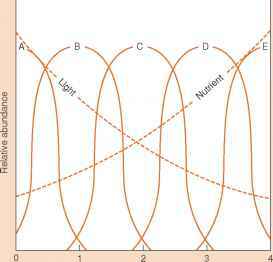 Two approaches have sought to overcome these problems and hence genetic comparisons allow the investigation of the nature of trade-off curves. The first is based on comparisons of individuals differing genetically, where different genotypes are thought likely to give rise to different allocations of resources to alternative traits. Genotypes can be compared in two ways: (i) by a breeding experiment, in which genetically contrasting groups are bred and then compared; or (ii) by a selection experiment, in which a population is subjected to a selection pressure to alter one trait, and associated changes in other traits are then monitored. For example, in one selection experiment, populations of the Indian meal moth, Plodia interpunctella, that evolved increased resistance to a virus having been infected with it for a number of generations, exhibited an associated decrease (negative correlation) in their rate of development (Boots & Begon, 1993). Overall, however, the search for genetic correlations has generated more zero and positive than negative correlations (Lessells, 1991), and it has therefore had only limited success to date in measuring trade-offs, despite receiving strong support from its adherents by virtue of its direct approach to the underlying basis for selective differentials between life histories (Reznick, 1985; Rose et al., 1987). The alternative approach is to use experimental manipulation to reveal a trade-off directly from a negative phenotypic correlation. The Drosophila study in Figure 4.19b is an example of this. The great advantage of experimental manipulation over simple observation is that individuals are assigned experimental treatments at random rather than differing from one another, for instance, in the quantity of resource that they have at their disposal. 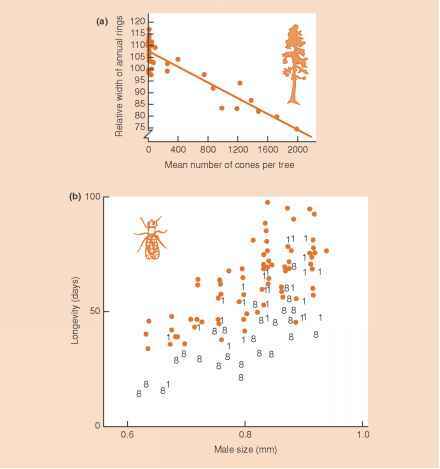 This contrast is illustrated in Figure 4.21, which shows two sets of data for the bruchid beetle Callosobruchus maculatus in which fecundity and longevity were correlated. 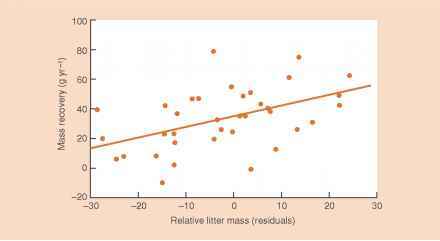 Simple observation of an unmanipulated population gave rise to a positive correlation: the "better' individuals both lived longer and laid more eggs. When fecundity varied, however, not as a result of differing resource availability, but because access to mates and/or egg-laying sites was manipulated, a tradeoff (negative correlation) was revealed. However, this contrast between experimental manipulation ('good') and simple observation ("bad') is not always straightforward (Bell & Koufopanou, 1986; Lessells, 1991). Some manipulations suffer from much the same problems as simple observations. For instance, if clutch size is manipulated by giving supplementary food, then improvements in other traits are to be expected as well. 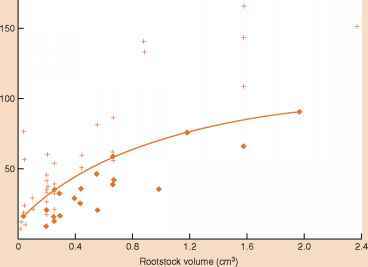 the population of fir trees in Figure 4.19a produced large and small crops of cones in response to factors other than resource availability, and that the negative correlation therefore genuinely represented an underlying trade-off. In the final analysis, though, it is generally agreed that tradeoffs are widespread and important. The problems arise in revealing and hence quantifying them. Most attention has been directed at trade-offs that reveal an apparent 'cost of reproduction' (CR). Here, 'cost' is used in a particular way to indicate that an individual, by increasing its current allocation to reproduction, is likely to decrease its survival and/or its rate of growth, and therefore decrease its potential for reproduction in future. This is shown by the fir trees and fruit-flies in Figure 4.19 and by the beetles in Figure 4.21. The costs of reproduction can be shown even more easily with plants. All good gardeners know, for example, that to prolong the life of perennial flowering herbs, the ripening seed heads should be removed, since these compete for resources that may be available for improved survivorship and even better flowering next year. When ragwort plants (Senecio jacobaea) of a given size are compared at the end of a season, it is only those that have made the smallest reproductive allocation that survive (Figure 4.22). Thus, individuals that delay reproduction, or restrain their reproduction to a level less than the maximum, may grow faster, grow larger or have an increased quantity of resources available for maintenance, storage and, ultimately, future reproduction. Any 'cost' incurred by contemporary reproduction, therefore, is likely to contribute to a decrease in residual reproductive value (RRV). Yet, as we have noted, natural selection favors the life history with the highest available total reproductive value: the sum of two quantities, one of which (contemporary reproductive output) tends to go up as the other (RRV) goes down. Tradeoffs involving the cost of reproduction are at the heart of the evolution of any life history.